To this end, De Boer researched playgrounds, rubbish collection sites and locations where young people hang out, among other places. The most promising method for the development of a self-regulating zone appears to be the recycling of the surplus energy that seems to be freed up at such spots. They appear to be visited primarily by diverse people who have energy to burn. De Boer noticed this energy going to waste, and conceived the idea of capturing it, letting it circulate and employing it to regulate social processes by means of an ‘automatic feedback system’. Her ideas regarding an ‘administration-free zone’ are an idiosyncratic answer to that question. 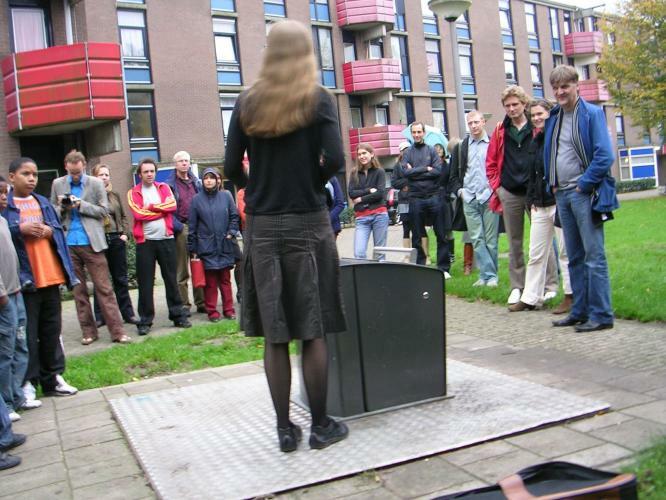 The project took the concrete form of a Powerpoint presentation by De Boer in the residence atelier in the Millingenhof, and several guided tours around the Ganzenhoef metro station.